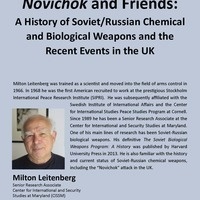 Milton Leitenberg was trained as a scientist and moved into the field of arms control in 1966. In 1968 he was the first American recruited to work at the prestigious Stockholm International Peace Research Institute (SIPRI). He was subsequently affiliated with the Swedish Institute of International Affairs and the Center for International Studies Peace Studies Program at Cornell. Since 1989 he has been a Senior Research Associate at the Center for International and Security Studies at Maryland. One of his main lines of research has been Soviet-Russian biological weapons. His definitive The Soviet Biological Weapons Program: A History was published by Harvard University Press in 2013. He is also familiar with the history and current status of Soviet-Russian chemical weapons, including the “Novichok” attack in the UK.